The Red Lights is the second most seedy place in the Grand Palais. 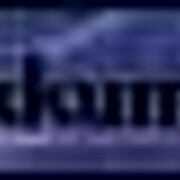 It's name is taken after the fact that this formerly subterranean zone's lights had a crimson tint that bathed this region in a blood hue but it can also be likened to the term 'red light district' as it it commonly termed because it is essentially the same thing. Here are located the foulest bars, dirtiest joints and raciest clubs. The owners here don't mind serving their food expired and alcohol to minors. Those looking for inexpensive company can find what they're looking for, for about 2 yen. It is suggested not to come here at night. Seedy Hotels, Dive bars and generally bad people can be found here. When searching for criminals in hiding this is a great place to start. Hakuren is what is known as a Tsuchimikado. Tsuchimikado practice the way of Onmyodo, and a telltale sign of this are the Ofuda that they wield in battle; slips of paper inscribed with mystic seals. These special charms are what they use to perform their techniques in place of handseals. Through this slips of paper members of his bloodline are able to set up jutsu like traps and give them certain triggers that would set them off. The Tsuchimikado alos have an ability to transfer self-targeting ninjutsu into others with these talismans as well. Hakuren changed the method of his bloodlines art into something more enjoyable to others. Instead of using the customary paper, Hakuren uses food as his talismans. Through a meal he can give a person chakra armor, a barrier, clones or some other buff. Hakuren can also place genjutsu into her food and drink. As mentioned before members of his bloodline are able to set up jutsu like traps and give them certain triggers that would set them off. One such trigger is attacking the talisman. Being that Hakuren’s talisman’s are consumables, eating them would cause the jutsu to be triggered. Thanks to some very generous patrons he has been able to afford to open a small place within the Red Lights of the Grand Palais. Such a seedy place was not his favorite idea for setting up shop, but it was the best he could do with what he had and he rather open up shop here than continue selling from a Food Stall. At least now he has an actual restaurant, though small it may be. He dreams of one day working within the Crystal District, which is home to the finest restaurants, bars and clubs. Hakuren little Nekoya was quite popular considering the food was top notch, a diamond among the rough, while all the other places here selling… Well let’s just say the owners here don't mind serving their food expired and alcohol to minors. Nekoya was pricier than nearly any other place in the district, but it was cheaper than eating at the Desert Crown. Hakuren doesn’t sell alcohol as he personally finds the taste offensive. He does however serve what he calls adult beverages. These drinks are imbued with a Drunken Stupor genjutsu. One can drinks these and feel the effects of alcohol without waking up with an hangover the next day. However Drunken Stupor is not the only genjutsu he has mixed with his drinks. There are a few others which he does not consider acceptable for a child, which he does sale to adults. One of this drinks was ordered pretty much on a daily basis. In fact the man that orders it just comes in the door. He was a young man dressed in fancy attire as if to say he is better than the common riff raff of this place. The way he carries himself as he walks as if every stepping stone was put there for his feet alone, one would think he was a noble. The man even calls himself an aristocrat. “My usual good sir,” He says with a smile. A small chill runs down Hakuren’s back every time he flashes that toothy grin. Hakuren pours a clear liquid into a wine glass and sits it on the counter. “One Vampire’s Kiss.” The name of the drink almost seems to fitting for the man. With his snow white hair, crimson red eyes and sickly pale complection, one might suspect that he was the real deal. The gentleman takes a sip of the drink and allows himself to fall under its effects. The taste however was incomplete as the was one last ingredient that needs to be added, but it’s one Hakuren allows the customer to apply themselves. The rich looking fellow takes a knife from the counter and cuts straight across the palm of his hand. The look of pure bliss as he enjoys every minute of it. The drink was imbued with the Masochism genjutsu and was created to pair well with the taste of blood. Gripping his hand into a fist the gentleman lets his blood pour into the wine glass and mixes it into the liquid. Hakuren found the there are many people with strange tastes, but he is willing to serve them with in reason. This was definitely one type of drink he would cancel the effects if one would overindulge. Jiro had just left the Miroku casino and made his way to the restaurant. It was upscale compared to the usual dens of inequity that the Chigokai frequented. And much more upscale than the usual restaurants of the Red Light District. Had Jiro not been there on business, he would have never stepped foot in such an establishment, but there were certain things that he could not control. Such as Akkuma telling him to check the restaurant out -- for clan reasons, of course. The blonde walked in right after the white haired male. He rolled his eyes at the extravagance. It made him sick, how this man was acting like he owned the place. 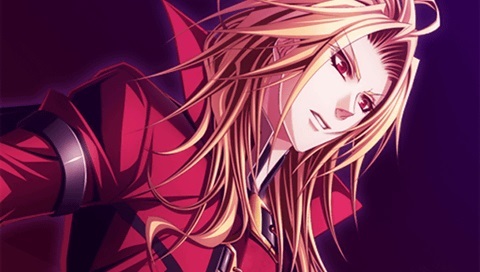 Jiro's own red eyes glanced over the other male slowly as he walked behind him. He smirked a bit as he sat down next to him, glancing from him to the bartender. The pulsing of the man's heart next to him sent a flutter of excitement down his spine. Even his heartbeat sounded cocky. He could be a good sacrifice for the Chigokai's God and his deranged ritual. He watched how the drink was made, blood included, before he made his choice. "I'll have the same," he said. 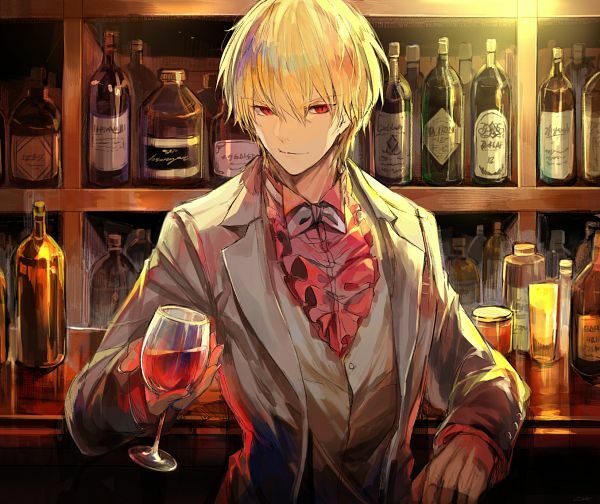 He looked at the 'aristocrat' before looking at the bartender again. "I heard your drinks're...unique." He gave him a small smirk before watching the white-haired male out of the corner of his eye. He licked his lip slightly as he watched how this man reacted to the pain while under the genjutsu. He looked at the cut on the male's hand. "Feel good?" he asked him curiously, tilting his head to the side. Hakuren sees Jiro enters the establishment and instantly Hakuren was sure he was sent here by Akkuma. Hakuren was unaware of how little Jiro was informed of the clan reasons for his visit. Jiro orders the same drink as the aristocat, which was no surprise there considering Jiro was of the Chigokai bloodline. “The drinks? 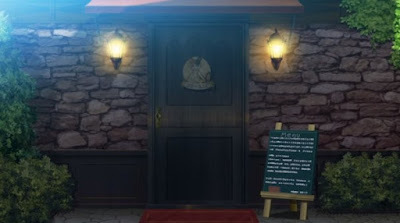 No, it's the food I serve that is the true uniqueness of my establishment.” Hakuren pours the clear liquid into a wine glass once again, imbues it with a Masochism genjutsu and places it in front of Jiro, “One Vampire’s Kiss on the house.” Jiro might wonder why he was getting free drinks, but Hakuren did not stick around long enough for him to ask. Jiro glanced around at the restaurant. It was definitely something unique in the otherwise horrid place that was The Red Light District. Almost as grand as Akkuma's casino. Once the drink was put in front of him, the Chigokai took a sip slowly. "I'll keep that in mind..." he answered when the chef told him it was the food he would enjoy more. He licked his lip slightly before he took the knife and slit his palm. Putting it over the drink, he used his blood manipulation abilities to let the blood trickle out before the wound healed. The pain made him shiver in pleasure. He took another sip as his red eyes followed Hakuren until he was out of sight. The chef was calm. The sound of his blood soothed Jiro as he nursed his drink slowly until he came back. A metal box. It clicked then why he was there and he felt a bit of pride that Akkuma-Sama had trusted him enough, finally, to collect money. He accepted the box and nodded. "I will. Thank you." Many things had changed in his dynamic with Akkuma recently. Mainly after he had become an Akkumaist, worshipping Akkuma as the god he truly was. But at the mention of food, he was broken from those thoughts and he nodded. "Whatever you think I would like," he replied when he was asked. He cut his palm again, adding a little more blood slowly, this time leaving the cut unhealed for then. Hakuren knew a little about Jiro; like the fact that he could sense blood. Along with the healing ability he seems to be showing off, Hakuren can conclude he is Chigokai. Hakuren almost told him not to overindulge from the drinks pleasures, but notices that the cuts healed though not as quickly as he would expect. 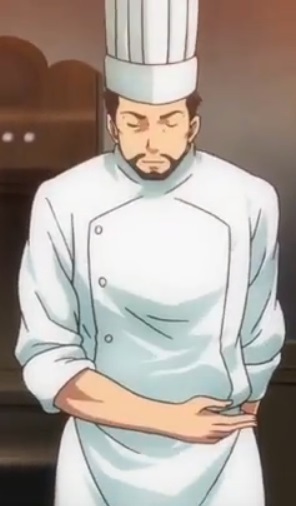 “I believe I can handle that.” Hakuren left Jiro and goes into the kitchen to begin preparing a dish. From out of sight Hakuren begins cutting up ingredients and imbuing them with a ninjutsu. Soon Hakuren would come back out holding a plate. 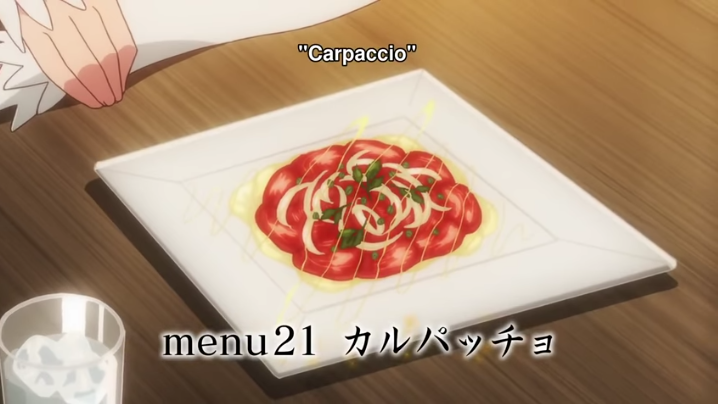 “Tuna Carpaccio.” Carpaccio is a dish that uses raw meat. Foreigners are always wary of such dishes. People that are not from this area only see the dry sands around them. They believe fish serve in a village like this cannot possibly be fresh. Surely Jiro knew better living here most if not all his life. Near the underground reaches of the Toraono Dojo is the Undersea. A vast subterranean cache of water purified and filtered through the desert sands. With the help of hunters and fishermen from villages all over the world, the waters of Undersea have been seeded with a vast variety of fish.